Preheat oven to 200°C. Spray the bread slices lightly with olive oil spray and place, in a single layer, on 2 large baking trays. Bake in oven, turning once, for 10 minutes or until golden. Meanwhile, cook the beans and asparagus in a large saucepan of boiling water for 3-4 minutes or until bright green and tender crisp. Refresh under cold running water. Drain. Combine the ricotta, herbs and lemon rind in a medium bowl. Season with salt and pepper. Transfer to small serving bowls. Rub garlic over one side of each crostini. 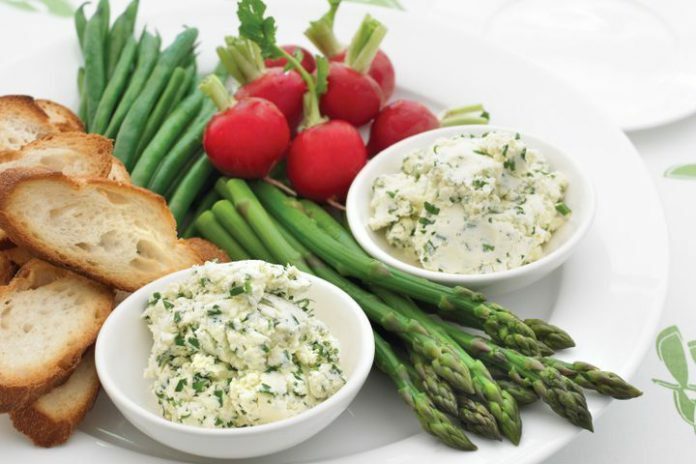 Serve with herbed ricotta, beans, asparagus and radishes.